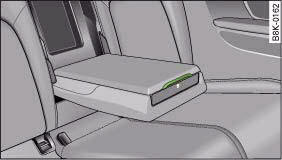 The first-aid kit is accommodated in the compartment behind the rear centre armrest. – Pull up the catch to open the storage compartment ⇒ fig. 265. On vehicles with a load-through hatch*, the first-aid kit is kept in the rear centre armrest. The centre armrest has to be folded down in order to access the compartment. The storage compartment will hold a maximum weight of 0.5 kg. Before folding the centre armrest back up into the rear seat backrest make sure the lid of the storage compartment is properly closed.